have always been in their own league. Why? 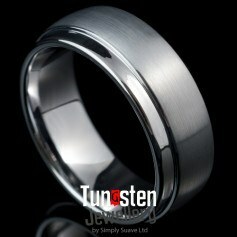 Unlike gold rings that go on sale at the jewellers, Platinum wedding rings have always maintained their premium because of their nobler content of precious metals If you are choosing platinum wedding bands you are also making a sound call besides investing in an alluring white grey metal. This platinum ring gives a nice whole look at 8mm width and about 1.7mm thickness and has a featured the contemporary maze/ grid pattern in polished on a brushed surface ring.